Up and down the proverbially sunny University Avenue in Palo Alto, California, work takes place in unconventional ways and places: at cafés and restaurants, on go-to-meetings taken on smart phones. Palo Alto teems with the flexible but no less intensive work styles integral to the creative economy. And these work styles now threaten to disrupt traditional economic sectors. The city's pioneering work culture makes it fertile ground for experimenting with how people work, and five months ago, the German software company SAP added to this dynamic by launching HanaHaus in the downtown area. HanaHaus is a community co-working space adapted for Palo Alto’s culture of innovation. The project was born of a collaboration with the city government. The city and its residents had long wanted to revitalize one of its cultural anchors, the historic Varsity Theater. 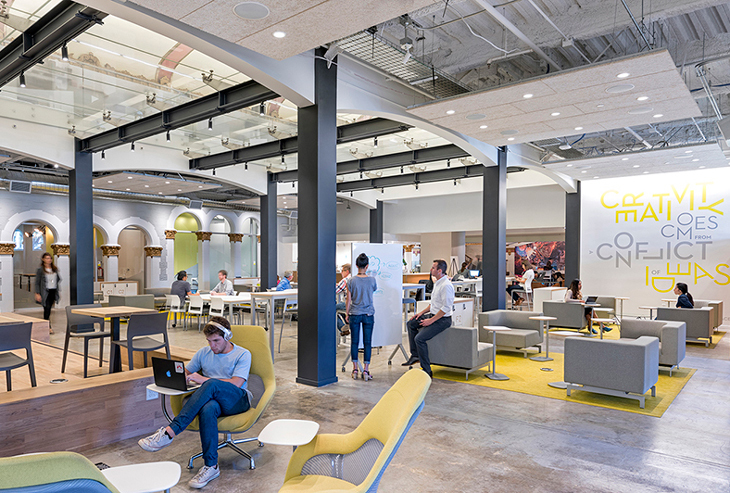 So SAP made this structure HanaHaus’ new home, and moved in with the aim of upholding the theater’s legacy as a community hub of cultural and social enrichment while adding a newfound dash of intellectual curiosity. SAP engaged Blue Bottle Coffee to become another partner in this venture. In collaborating with both the city and this local institution of artisanal coffee, SAP aimed to merge the Bay Area and Palo Alto’s cultures of innovation with the café lifestyle. HanaHaus is unique in that it reflects SAP’s philosophy: that significant innovation only happens where social ties within the larger community are strengthened. So while HanaHaus is the street’s first co-working space, it also represents an entirely new workspace typology. In the passageway beneath the marquee, Blue Bottle has set up a kiosk, serving coffee to passersby: local residents, students and faculty from Stanford, and the host of entrepreneurs, venture capitalists and tech sector workers who concentrate in this Silicon Valley epicenter. The kiosk functions as a critical touch point between the street and HanaHaus. From there, the space unfolds in layers: from the outside café environment at the entry through the most private workspaces inside. People flow in and out, choosing the zone that suits them most. There are two entirely public courtyards: one outdoors that joins as an inlet to the bustling street beyond the marquee; the other, just inside the theater’s main hall. The outside courtyard preserves the original mission-style architecture, and the inside maintains the original 1927 details—beautiful tile-work, columns and the traditional “nickelodeon” red-and-gold baroque décor. Both are free to use. They also have an array of seating options and a sort of old world café atmosphere. The Blue Bottle counter inside serves as the boundary and connection between these public areas and the co-working space—it is the industrious heart of HanaHaus. The co-working space is large, open, and encircled by more private settings. Like the public café areas, the seating is totally varied: meeting areas, with floor-to ceiling windows, are set off from and easily rearranged by moveable furniture. There are small “quiet rooms” along one wall; along the other, there’s a private conference room and a maker space, which accommodates hands-on work and workshops like the recent demo on chocolate-making. At night, the main hall transforms to host educational and cultural events, lectures, readings and TED-like talks, breathing new life into this staid community hub. As Gensler’s Corinda Wong, explains: “What sets HanaHaus apart is that it offers creatives ways to create their own space. It provides entrepreneurs and the public access to tools they wouldn't normally have access to in a public space.” Gensler provided the necessary tools to accomplish this by building in different levels of work modes, both group and intimate, and by selecting furniture that is at once comfortable and functional. Work and life are now connected and continuous. The sites in which we experience both should reflect this dynamic. That means experience matters more than ever. Why? Because through the fluidity of experience and a culture that encourages reaching beyond one’s own walls, the synergy of innovation is sparked and developed to more meaningful fruition. There’s an artistic edge in creating spaces that both integrate and balance these various moods and modalities—that is, people’s experience, both real and aspirational. HanaHaus’ design is geared towards situating users’ work socially within the larger global community, while still providing an intimate space for each individual. The balance between a creative workplace and a community center has been realized at HanaHaus within the context of a historic building. The modern and historical aspects complement one another. HanaHaus offers an alternative to the typical office setting that has been a staple of work for so long. It grounds users within the surrounding community, allowing them to work best in present time. That is why it is so popular—and why it works. Based on HanaHaus’ success, SAP plans to replicate the model in other capitals of the creative economy, starting with London, Berlin and Shanghai. Stay tuned.